Background: Although the Da Vinci robotic surgical system is routinely used in urological and gynecological procedures its utilization is less common for general surgery procedures. Minimally invasive Heller myotomy with gastric fundoplication has been performed since the early 1990’s, and this procedure is currently performed laparoscopically and robotically assisted. However, current comparative studies regarding the perioperative outcomes of these techniques are scant. This study aims to evaluate perioperative outcomes of Heller myotomy with gastric fundoplication performed with laparoscopic, robotic and open techniques. Methods: This study is a multi center, retrospective analysis utilizing a large administrative database. The University Health System Consortium (UHC) is an alliance of more than 100 academic medical centers and nearly 200 affiliate hospitals. UHC clinical database/Resource Manager (CDB/RM) allows member hospitals to compare patient level risk adjusted outcomes for performance improvement purposes. Data from the CDB/RM was queried using International Classification of Diseases (ICD-9) codes for esophagomyotomy, laparoscopic gastric fundoplication, open gastric fundoplication and robotic assistance from 2008 through 2010. Main outcome measures analyzed were mortality, morbidity, length of stay (LOS), intensive care unit (ICU) admission rate, 30-day readmission, and cost. Results: 824 patients underwent laparoscopic esophagomyotomy, 65 patients underwent robotic assisted esophagomyotomy, and 178 patients had open esophagomyotomy surgery during the 16 month period between Oct 2008 and January 2010. Comparison of patients with laparoscopic esophagomyotomy and robotic assisted esophagomyotomy demonstrated no significant difference in mortality (0.12% vs. 0.0%; p=1), morbidity (10.68% vs. 6.15%; p=0.3), LOS (2.79 ± 3.59 days vs. 2.28 ± 1.77 days; p=0.3), ICU admission rate (7.32% vs. 3.08%; p=0.3), 30-day readmission rate (1.82% vs. 3.08%; p=0.4), and cost ($12,320 ± 12,327vs. $14,055 ± 5,040; p=0.3). 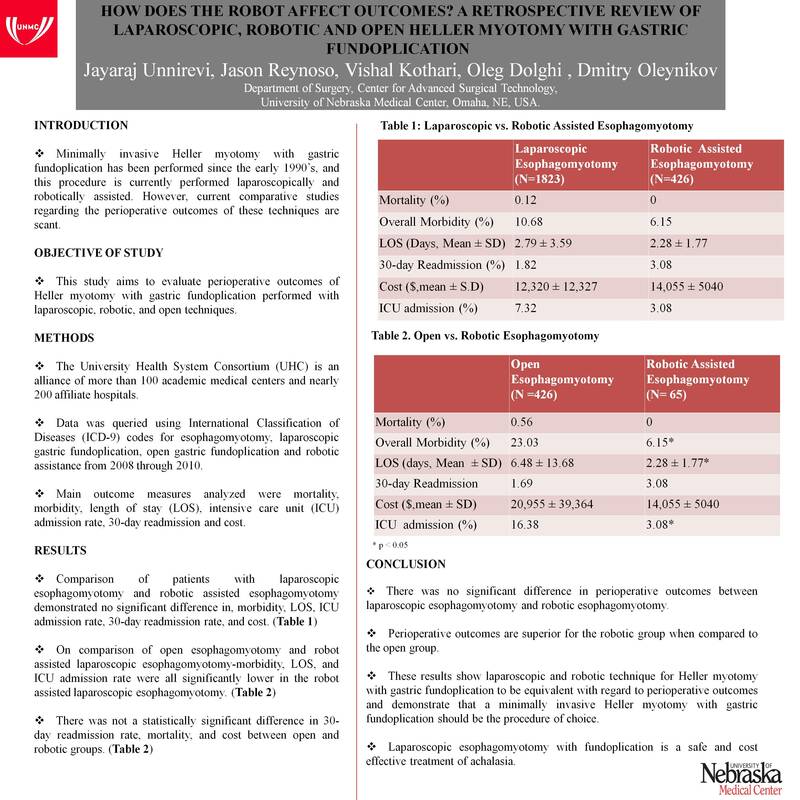 On comparison of open esophagomyotomy and robot assisted laparoscopic esophagomyotomy morbidity (23.03% vs. 6.15%; p= 0.002), LOS (6.48 ± 13.68 days vs. 2.28 ± 1.77 days; p=0.01),and ICU admission rate (16.38% vs. 3.08, P=0.004) were all significantly lower in the robot assisted laparoscopic esophagomyotomy. There was not a statistically significant difference of 30-day readmission rate (1.69% vs. 3.08%; p=0.6), mortality (0.56% vs. 0.0%; p=1), and cost ($20,955 ± 39,364 vs. $14,055 ± 5,040; p=0.2). Conclusion: There was no significant difference in perioperative outcomes between laparoscopic esophagomyotomy and robotic esophagomyotomy. However, perioperative outcomes are superior for the robotic group when compared to the open group. These results show laparoscopic and robotic technique for Heller myotomy with gastric fundoplication to be equivalent with regard to perioperative outcomes and demonstrate that a minimally invasive Heller myotomy with gastric fundoplication should be the procedure of choice.